July is always a super busy, but fantastically fun month. We have the celebration of Independence Day, July 4th. The church picnic that is our big summer fellowship and the Vacation Bible School kick off. That leads right into VBS, and boy is it fun. An “all hands on deck” event that has us busy even if we are not reporting at the church each day! On the heels of VBS there are hikes and youth camp. Youth camp, eight days of fun for all three of my teens, 8 days of quiet for me. Now if you know me, you know I am an introvert who loves her quiet. But I love and delight in my teens even more, so the days are too quiet when they are all off having a blast. With all that, amazingly enough, there are many pockets of time to get in a chapter or two. And even more time when the kids have left, and I decide to take a Mom Retreat road trip. That trip netted me 2 full audiobooks! One non fiction and one over due fiction. 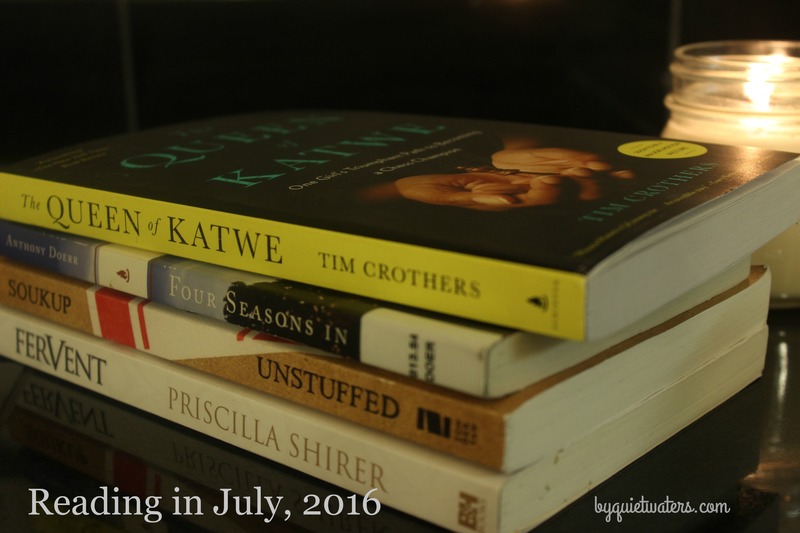 Here’s what I read in July. A Thousand Miles to Freedom by Eunsun Kim – My teens and I listened to this in audiobook to and from a recent camping trip. A Thousand Miles to Freedom is the story of Eunsum Kim’s escape from North Korea, and the long difficult journey to South Korea. What struck me most in this story is what South Korea has in place to receive the people who make it out of North Korea. They have a strong process in place, and the resources to sort out refugees, and to help refugees make a new start for success in a free society. Something our own country could glean some wisdom and planning from. All the Light We Cannot See by Anthony Doerr – Another audiobook that I finished listening to in July (actually started it in May). What a good story. When I couldn’t stop talking about it to my husband, he asked me to download it to his phone for his long drive back to work. He listened to it during one long drive back to work. So fun to share a story with hubby. Fervent: A Woman’s Battle Plan to Serious, Specific and Strategic Prayer by Priscilla Shirer – So, I have this book in paperback, on my kindle and on audible. And of all the forms, the audible version is how I finished the book. The audible version is narrated by the author and is well done. It is good to have the paperback version, as I like to underline and write notes in books like this! 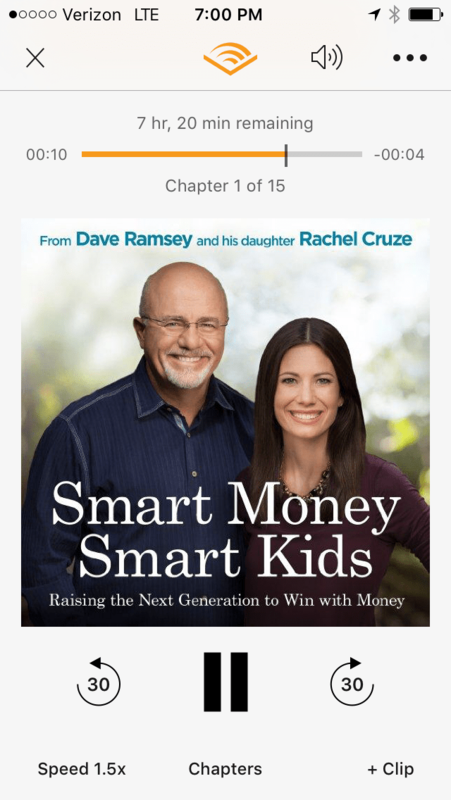 Smart Money Smart Kids by Dave Ramsey and Rachel Cruze – My husband listened to this book earlier in the month and asked me to read it as soon as possible. Ah, do you see something fun emerging? Story sharing with my traveling hubby, another thing helping us to stay connected. So when I headed off on my mom retreat, this is the book I started off the trip with. What I gleaned from this book syncs with my hubby’s thoughts, and more. I appreciate books that shine light in areas of my heart that need to be exposed. 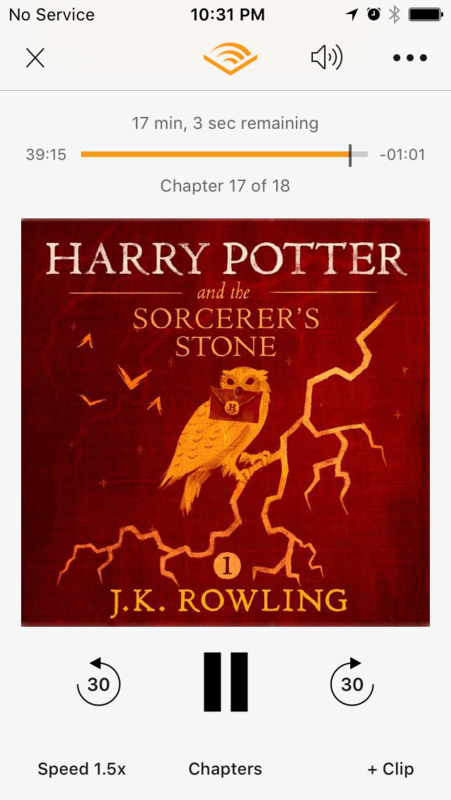 Harry Potter and the Sorcerer’s Stone by J.K. Rowling – this is the other book I listened to on that mom retreat. What a fun story to finally have on my “finished reading” list! 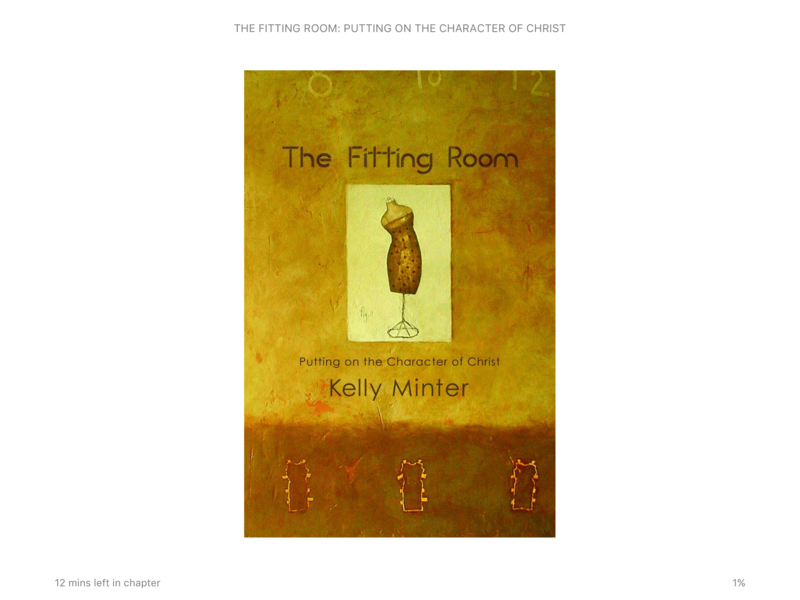 The Fitting Room by Kelly Minter – This book has been one of my morning reads, and I used it as a devotion/study companion to my morning Bible study. The Present Principle by Claire Diaz Ortiz. I read this short book while sitting by the North Rim of the Black Canyon. A short 3 mile round trip leads to Exclamation Point, where I spent about an hour reading, taking photos and delighting in the surrounding beauty. 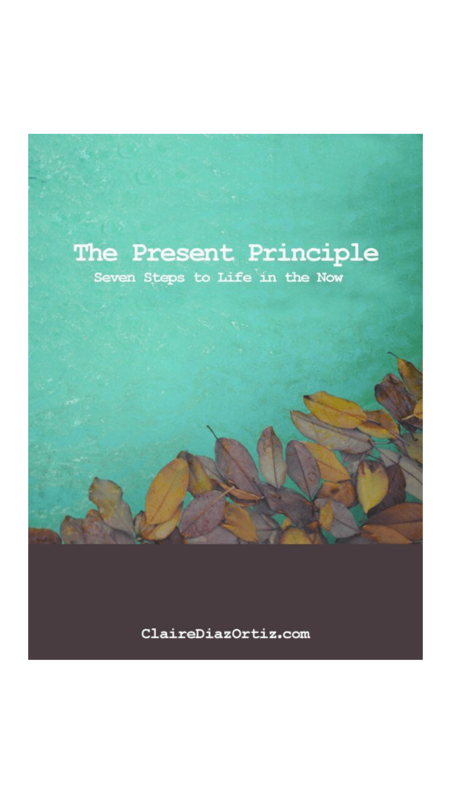 I really appreciate the message of this book, by implementing the PRESENT PRINCIPLE, one is giving herself a gift. Cinder by Marissa Meyer – this is my MMD Reading Challenge selection for a book chosen for you by… This book was recommended to my by a couple of my daughters, and my 16 year old was the one who put it on my night stand. It surprised me how much I enjoyed this scifi retelling of Cinderella, maybe when my summer TBR stack gets shorter I’ll add the next book in the Lunar series. Four Seasons in Rome by Anthony Doerr – By the author of All the Light We Cannot See, this memoir is about his year in Rome, with his wife and infant twin sons. I loved traveling through Rome through his words. Unstuffed by Ruth Soukup, I wrote about this book here. Total books read: 5 Audiobooks, 2 books on Kindle, 3 Paperback books. How good it has been! 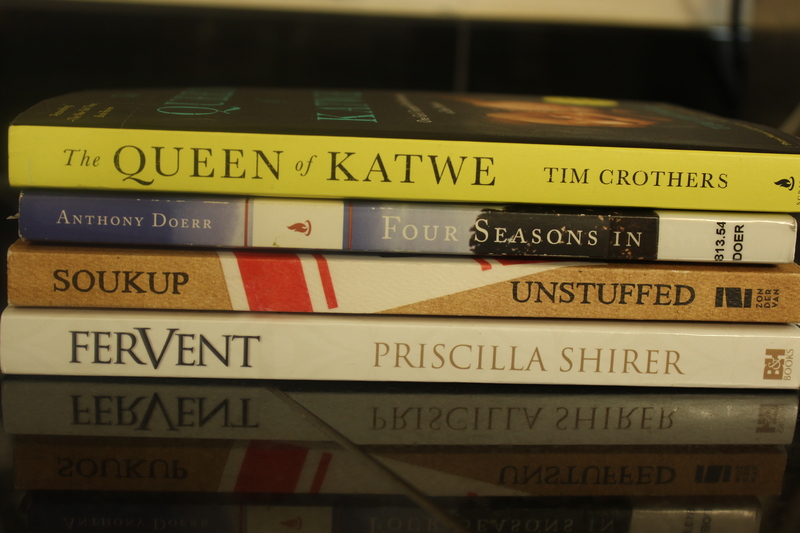 What have you been reading this month?